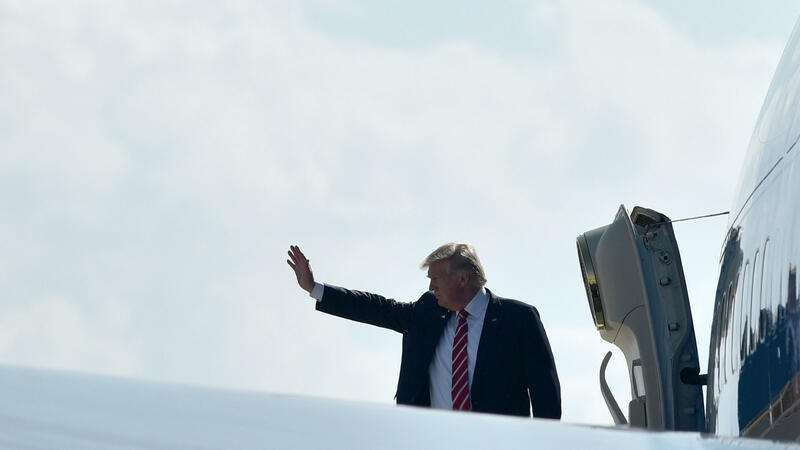 President Trump, shown boarding Air Force One in Tampa this week, is to meet with airline CEOs at the White House. Dated infrastructure is one topic expected to be discussed Thursday morning. CEOs of major U.S. airlines are scheduled to meet with President Trump on Thursday morning. The session comes after airlines had to deal with what one CEO called "turmoil" over the president's travel ban. The focus of the meeting will more likely be on airport infrastructure, the air traffic control system and what the airlines say is unfair foreign competition. Airline pilots and flight attendants are on the same side as their bosses when it comes to foreign competition, and their message should sound familiar to President Trump. "We should put America first, protect U.S. jobs and strongly enforce our trade agreements," says Delta pilot Bill Bartels, expressing a sentiment shared by other leaders of the Air Line Pilots Association. They've called on President Trump to reverse the Obama administration's decision to allow Norwegian Air International to fly routes into the U.S. They say the Ireland-based company uses its location to bypass labor laws and hire cheaper flight crews. "This is not how we make America great," says Todd Insler, who heads United's pilots union. "Hurting U.S. workers, skirting the law is not how it should be done." Some consumer groups, however, prefer that the president not side with American, Delta and United. Paul Taylor of FlyersRights.org says, "Apparently, the top three carriers anyway in the U.S. feel that they don't want to compete and they would rather just shut out foreign competition." Other topics likely to be discussed at the White House include modernizing the country's air traffic control system, regulatory reform and airport infrastructure needs. During the campaign, Trump said the country's outdated airports "are like from a third-world country." And that should be music to the ears of airline CEOs, says DePaul University airline expert Joe Schwieterman. "Airlines have been voicing complaints for a long time about the taxes their passengers pay and infrastructure falling behind, you know, but today's meeting is a little unprecedented. [They'll] actually have a new president's ear who's made some comments that he's willing to think big." While the CEOs of United and Delta have breakfast with President Trump at the White House, American Airlines CEO Doug Parker won't be there because of a scheduling conflict. Parker had called the president's executive order prohibiting citizens of seven Muslim-majority countries from traveling to the U.S. "divisive." But a company statement says Parker shares the president's commitment to modernize infrastructure and to promote safe and efficient air travel. The CEOs of major U.S. airlines are meeting with President Trump this morning. Those executives have been in a bit of a bind in recent weeks, trying to figure out how to interpret the president's immigration order and what it meant for who they could and could not let on their airplanes. The topics likely to come up at today's meeting might be less awkward - airport infrastructure, the air traffic control system and what the airlines say is unfair foreign competition. NPR's David Schaper reports. DAVID SCHAPER, BYLINE: Airline pilots and flight attendants are on the same side as their bosses on one issue, and their message should sound familiar to the president. BILL BARTELS: We should put America first, protect U.S. jobs and strongly enforce our trade agreements. SCHAPER: While they are not at today's meeting, Delta pilot Bill Bartels and other leaders of the Air Line Pilots Association call on President Trump to reverse the Obama administration's decision to allow Norwegian Air international to fly routes into the U.S. They say the company is based in Ireland, so it can bypass labor laws and hire cheaper flight crews. Todd Insler heads up United's pilots union. TODD INSLER: This is not how we make America great. Hurting U.S. workers, skirting the law is not the way it should be done. SCHAPER: But some consumer groups prefer the president not side with American, Delta and United. Paul Taylor is with flyersrights.org. PAUL TAYLOR: Apparently the top three carriers anyway in the U.S. feel that they don't want to compete, and they would rather just shut out foreign competition. SCHAPER: Other topics likely to be discussed at the White House include modernizing the nation's air traffic control system, regulatory reform and airport infrastructure needs. During the campaign, Trump said the nation's outdated airports are, like, from a Third World country. And that should be music to the ears of airline CEOs says DePaul University airline expert Joe Schwieterman. JOE SCHWIETERMAN: Airlines have been voicing complaints for a long time about the taxes their passengers pay and infrastructure falling behind, you know, but today's meeting is a little unprecedented. They'll actually have a new president's ear who's made some comments that he's willing to think big. SCHAPER: While the CEOs of United and Delta have breakfast with President Trump at the White House, American Airlines CEO Doug Parker won't be there because of a scheduling conflict. Parker had called the president's executive order prohibiting citizens of seven Muslim-majority countries from traveling to the U.S. divisive. But a company statement says Parker shares the president's commitment to modernizing infrastructure and to safe and efficient air travel. David Schaper, NPR News, Chicago. Transcript provided by NPR, Copyright NPR.